Here’s a way for manufacturers of alternatively fuelled vehicles to gain a foothold in urban deliveries. Dawsongroup, one of the UK’s largest commercial vehicle leasing companies, is offering customers the chance to try out alternatively fuelled vehicles (AFVs) to ensure they are right for them before committing to a long-term lease. John Fletcher, MD at Dawsongroup truck and trailer, said: “With so many changes to legislation and the development of AFVs, operators are keen to find ways of sensibly trialling the more practical solutions being offered. 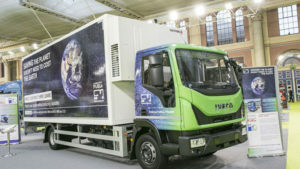 The Dawsongroup fleet includes a 12-tonne Iveco Eurocargo powered by compressed natural gas (CNG) and a dual-compartment Paneltex refrigerated body, with a hydraulically driven fridge unit from Swedish firm Hulstein, which the company exhibited at last week’s Freight in the City expo. Dawsongroup said it is also working with Paneltex to bring a range of electric trial vehicles to its rental line-up in the near future.